The second story arc of the runaway hit VERTIGO series Y: THE LAST MAN is collected in this new trade paperback! Reprinting issues #6-10, CYCLES features a special sketchbook section by artist and cocreator Pia Guerra. As Yorick Brown, the last man on Earth, begins to make his way across the country to California, he and his companions are forced to make an unscheduled stop in Marrisville, Ohio-a small town with a big secret. 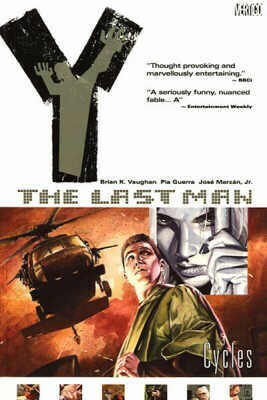 Collects Y the Last Man #6-10.